To provide enhanced network management with cost saving benefit to customers, PLANET has released a new version of the FNSW-2400PS, the Layer 2 Web Smart Switch with PoE injector function. 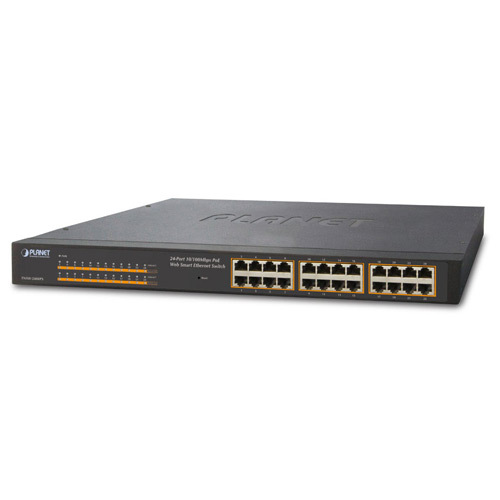 The FNSW-2400PS is equipped with 24 Fast Ethernet ports integrated with PoE injector function. With 125-watt PoE power budget, it provides a compact, affordable, safe and reliable power solution for small to medium enterprises. The PoE in-line power following the IEEE 802.3af standard makes the FNSW-2400PS able to deliver power to 24 PoE compliant devices at the distance up to 100 meters through the 4-pair Cat 5/5e UTP wire. It optimizes the installation and safe power management of network devices such as wireless access points (AP), Voice over IP (VoIP) phones and IP surveillance cameras. With more efficient switching power supply, the efficiency of the FNSW-2400PS would be much better than four linear power adapters in the long run and offer customers the key benefit – energy saving. The Power over Ethernet technology enables the Ethernet wire to carry both data and power. Thus, the FNSW-2400PS reduces the need for cable installation and eliminates the need for extension cords or electrical outlets on the wall, ceiling or any unreachable place. In all, it lowers the installation costs and simplifies the deployment effort. For efficient management, the FNSW-2400PS is equipped with remote Web interface. It can be programmed for advanced switch management functions such as port configuration, VLAN, Rapid Spanning Tree Protocol (RSTP), IGMP Snooping, port trunk, QoS, bandwidth control, and MAC address / TCP & UDP filter. The FNSW-2400PS provides port-based / IEEE 802.1Q / MTU VLAN (port based / IEEE 802.1Q VLAN including overlapping). The VLAN groups allow the FNSW-2400PS to have a maximum of up to 24 port-based VLAN groups or up to 32 IEEE 802.1Q VLAN groups. On the other hand, the MTU VLAN divides port 1 to port 24 as separate LAN group. Via supporting port trunking, the FNSW-2400PS allows the operation of a high-speed trunk to combine multiple ports. The FNSW-2400PS also provides two groups of up to 4-Port 10/ 100Base-TX trunk support with up to 800Mbps bandwidth per trunk group. With 24 10/100Mbps ports, the FNSW-2400PS provides a cost-effective and high-performance solution for power users. With its 4.8 Gigabits per second, non-blocking switch fabric, this device can easily provide a local, high bandwidth Fast Ethernet network for your departmental backbone. Providing up to 125 watts of PoE budget, in-line power interface, the FNSW-2400PS helps the administrator to flexibly build a power centrally-controlled IP phone system, IP camera system and AP group for the enterprise. For instance, 24 cameras or wireless APs can be installed around the corner in the company for surveillance or wireless roaming demands. Without the power-socket limitation, the FNSW-2400PS makes the installation of cameras and wireless LAN AP more efficient. 2014-03-07 1.03.10 Fix VLAN issue.